Tuesday December 23rd 1924 It snowed most of the day. I was busy with different things. Ott was not home for dinner. Fannie went to town in taxi to do shopping. I had long letter from Lydia telling of the wreck with sleet storm there. a letter from LeGrand and several cards. Wrote H E Rowe. 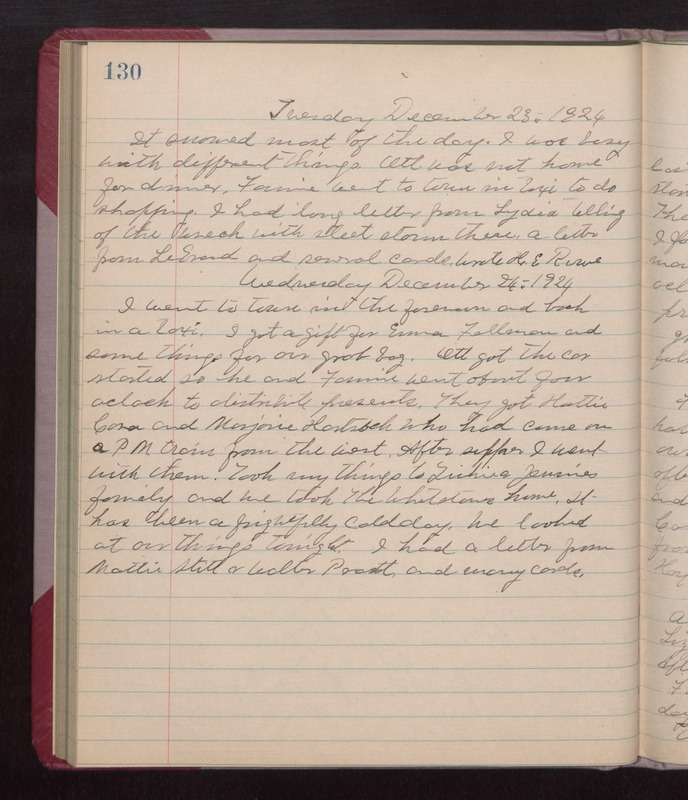 Wednesday December 24th 1924 I went to town in the forenoon and back in a taxi. I got a gift for Emma Fellman and some thing for our grab bag. Ott got the car started so he and Fannie went about four oclock to distribute presents. They got Hattie, Cora and Marjorie Hartsock who had come on a PM train from the west. After supper I went with the. Took my things to Tishies & Jennies family and we took The Whetstones home. It has been a frightfully cold day. We looked at our things tonight. I had a letter from Mattie Stitt & Walter Pratt, and many cards.